It was in the late 60’s when I first heard of Buffy. I lived in Europe then; the world was much bigger than it’s now and the U.S. were quite far away from Europe. Yes, the people who were interested in popular music would find ways of knowing what was happening overseas, but many times it was not a first hand info that would reach us. That was exactly how Buffy Sainte-Marie’s name came to my world. Namely, Donovan Leitch (then a very popular folk musician from Scotland) had an album titled “Universal Soldier” on which he performed the song with the same title. Of course, it was Buffy’s song and her name was on the cover. Hello Buffy! Later I learned of more of her songs, and then the movie “Soldier Blue” came to our big screens…I ended up living in America and having a bunch of Buffy’s records and learning more about her – about her life, her activism on behalf of Native American peoples, about the years when she was banned from the radio without even being aware of the fact, about her very positive personality and great optimism. I watched her interviews and performances (it’s so easy nowadays with the Internet etc.) … The thing that surprised me the most was the fact that she was one of the earliest digital visual artists. Obviously she is a great person deserving a full admiration , but also I felt that in many ways we were very similar to each other, and because of that I was able to understand many aspects of her life and her art. Also, we are on the same side of many important issues. Having all this in mind I started playing with an idea of painting a picture as a homage to her. Some two years ago I started working on the idea. There was a good deal of thinking and sketching both on the paper and computer. One thing I was sure I wanted was Buffy in the center of the picture and riding a bison. There were several color options for the animal: white as an albino, pink and finally sky blue – in every option it would be a symbol rather than a real animal. There was an option of a wolf following the rider and a tepee flying in the sky above her head. What I couldn’t decide was what to take as the background. That was an issue that kept me spinning in circles for about a year’s time. I was still coping with the problem when a year ago came an invitation for participation in the Musorgsky project. It was a good news. I needed a break. I needed to work on something completely different. Filled with energy I painted my ‘Baba Yaga” and “The Great Gate of Kiev” in four months, creating also tens of very useful digital versions of “The Gate”. After the Lourdes show – in the late March – I returned to my previous project. This time I knew what I exactly wanted: the background (physical and symbolic) will be the Aztec calendar slightly changed for the purpose of the painting. The calendar is also a Sun disc shining with the white and yellow light in the central part. Instead of the head of the bloodthirsty god Tonatiuh I placed Buffy’s smiling face shining in the very center of the disc and the picture as well. In her right hand she holds a bow – a weapon that she transformed into a musical instrument – a music harp. The Sun is opposed by the moon (another heavenly body important to the Natives Americans) in somewhat cooler tones but still with colors matching those of the disc. 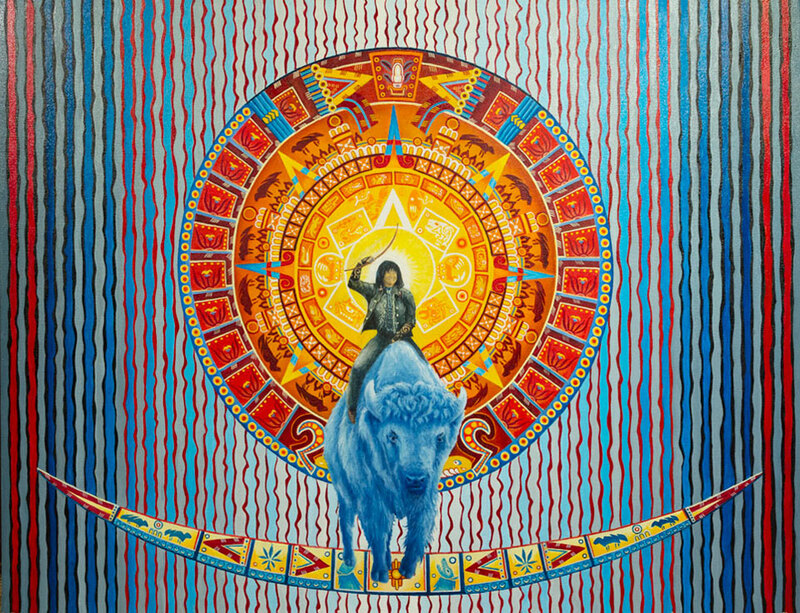 Here comes the idea of the Starwalker (another great Buffy’s song, by the way): she is among the cosmic bodies riding a sky blue bison that is standing on the image of a stylized star. The Sun and Moon are packed with the Aztec’s imagery (it took some time to study their ingenious way of stylizing things) and there was still a considerable empty space left (another background). With so many details on the Sun disc I needed a neutral background that would bring forward the disc, the Moon and Buffy on the bison. That’s why I used the gray and black color and also a quite simple pattern of vertical lines. These gray, black, blue and red lines are representing the sky(s) and are also illuminated and executed in the manner of producing the waves moving from the sides toward the center pushing the central figures even more forward. The waving lines can also represent the sound waves (of music) moving from the center to the sides of the image.